I also had a sneaky suspicion that our already rather empty fridge and cupboards would look especially sad and sombre after a physically long and heavy day. In preparation for all of this sure I could have gone shopping but…I didn’t. Instead, the night before I made a tart shell, and not just any tart shell, but a tart shell that would happily encase a pile of mascarpone and cream goodness the following day. A drizzle of some delicious local honey and enough summer berries to make it all worth while. 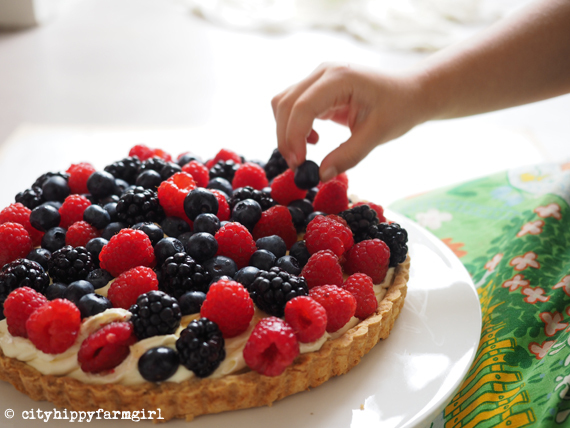 The next day with tired arms and weary feet, the small people helped assemble the tart. With mascarpone whipped, all that was left was to pile all the berries on, one for the tart, one for them. It seemed to work out. In a blender, pulse your flour, sugar and butter until it resembles bread crumbs. Tip out to a large mixing bowl and add vanilla, egg yolk and cold water. Knead mixture lightly until it comes together to form a dough. Roll dough between two pieces of baking paper, to about .5cm and rest in the fridge for about half an hour. Shape into your greased tart tray. Bake blind at 180C for about 20 minutes, or until golden. Allow tart shell to cool completely before you add the middle mixture. Whip cream to soft peaks and then gently whip through the mascarpone and vanilla. Spoon mixture into the tart shell and drizzle honey over it all. All your favourites, pop them in, and make it look gorgeous. Eat with enthusiasm and the knowledge that there will be room for a second slice in there. This entry was posted in Food Glorious Food by cityhippyfarmgirl. Bookmark the permalink. Oh delicious. Good food planning too. It makes it easier to cook from scratch when you prep a day a head. Your garden project sound exciting. Exhausting but exciting! The magpies have targeted all our strawberries this season. Cheeky things. A perk at the end of the day right. I always feel like I’m ahead of the game a little when I do one the day before, (it’s the little things that I enjoy right 🙂 ) I’ve been saying I will do some caramelised onions for I think two months now…sigh, still not done. Maybe tomorrow…maybe. And the kids were proud of their efforts, they insisted on candles, I believe it was a favourite toys birthday. It is Jane, it really is! Brydie, you are a baking genius. Good on you prepping a day out, makes things taste a whole lot better when you are tired and achey from a big day huh? 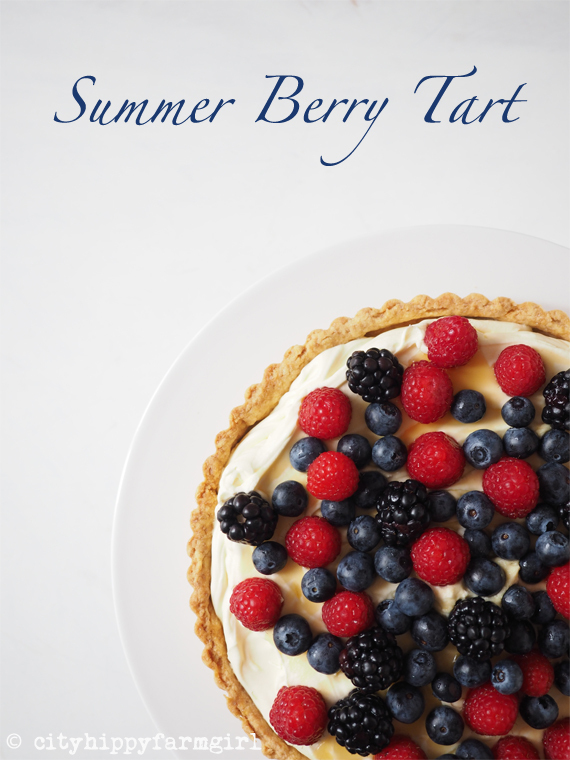 I love your Summer Berry Tart, its beautiful. I keep buying berries to bake with, but they somehow find their way to my tummy before that happens. Oops! The berry season is so small it’s hard not to Anna! I’d happily eat all kinds of berries all throughout the year…and no the frozen ones, just don’t cut it. Its not summer here in Florida but with temps in the 70’s and 80’s it kind of feels like it. 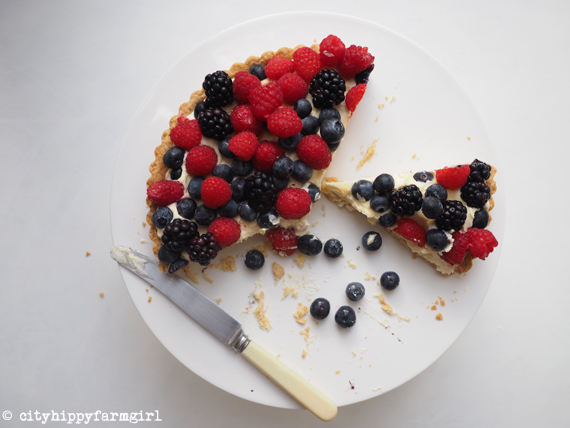 Your tart is so pretty and I’m sure delicious. It was Karen 🙂 I suspect another may be on the horizon in the not so distant future. Scrumptious tart! I would happily work in anyone’s garden if that was the end of day treat. Hope the big effort in the garden shows rewards real soon. Me too Tamara…I may quietly sob a little if we can’t grow anything after all the effort! sounds perfect Rose. Let me know how you go. Actually while I’m there raiding, I might take a peak at your dehydrator, which brand do you use and are you super duper happy with it? I have a 9 tray Excalibur. I have had it for so many years I bought it last century (same with my Vitamix) and I am ashamed to say I didn’t use it for quite a few years but I use it all of the time now and it was well worth it’s purchase price. The best thing about it is that it has square trays that slide in and out of the dehydrator that you can put in as many or as few trays as you like and it has an adjustable temperature knob. More expensive than a regular dehydrator but worth it. I do my research, I save up and I get the very best value for my money whenever I make a purchase. I think they are a lot cheaper now than when I bought mine as I had to get mine sent to W.A. (where I come from originally) from Queensland. I would seriously recommend them BUT in saying that, where you live, you could completely and utterly make and use a solar dryer. There are some seriously excellent free plans online and twood be a great thing to construct with your kids. I thought you might have the mighty Excalibur…hmm, I’d love to think my building skills are up to making one, but as quite often happens my ideas are far better than the actual actions. Will keep musing on this one, not living in an apartment now, certainly does open the creating possibilities a little. I saw an amazing creation that was a series of homemade trays made from thin pine frames with some kind of netting stretched over it and tacked on. Each tray was suspended from the other tray by 4 ropes and the top tray was hung up to a tree branch and the whole lot was covered with draped net curtain. It certainly didn’t look difficult to achieve and you could make it a “thang” to do with your kids. This looks SO good. And sounds like the perfect reward at the end of a hard day gardening! There is no denying it Sarah…it WAS good! Save you a slice for next time Julie.